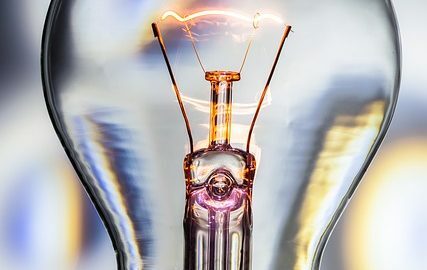 Thomas Edison might not have invented the first electric light bulb, but he probably invented modern scientific ambition. He spent as much time at the patent office and national newspaper as he did in his laboratory, which is why, when you think of the light bulb, its true inventor doesn’t pop into your head. The light bulb resulted from almost a century of trial and error by scientists who weren’t as invested in their public image as Edison was. He even had a snappy name for his laboratory: The Invention Factory. Like any aspiring celebrity scientist, he also had a professional enemy: Tesla. When Edison began his grand project of installing electric lights in every rich household, Nikola Tesla and George Westinghouse had just invented AC (alternating current) power. Edison’s light relied on DC (direct current) power, so his “eureka!” came with a significant drawback: after working so hard to corner the market, Tesla snatched it from right under his nose with an improved way to deliver electricity. Edison’s project needed a banner, so he started a company so iconic that it’s a household name over a hundred years later: It’s now called General Electric. With the advent of AC power, Edison was swiftly fired from his own business, but not before going to war with Tesla over the violation of his patents. Edison was nothing if not a marketing mogul, so he did his fair share of insulting his rival product, publicizing the grisly deaths caused by AC electrocutions. Even this wasn’t enough to win the lucrative market his lightbulb had created. Tesla walked away with most of the proceeds and a reputation as The Wizard of Electricity, but Edison changed the world. He probably would have preferred to remain on top of the world he changed, but invention demands constant investment in new research and development. Premier Lighting appreciates the history of light and innovates its design for the future. Contact our experts today and revamp your home’s lights tomorrow.